An attractive and economical option for food service establishments, the Thunder Group CR313 Purple Melamine Bouillon Cup 8 oz. is perfect for serving individual portions of soup, sides, and sauces. Designed to easily complement any table setting, this cup features tapered sides and a flat base for stability. Thanks to its heavy-duty melamine, this bouillon cup provides superior stain and scratch resistance for high-volume service. $17.99 Thunder Group CR313BU Purple Melamine Bouillon Cup 8 oz. - 1 doz. $19.99 Thunder Group CR9108BU Purple Melamine 5-1/2" Saucer For CR313, CR5044, ML901, ML9011- 1 doz. $22.99 Thunder Group CR5608YW Yellow Melamine Salad Bowl 8 oz. - 1 doz. $23.99 Thunder Group CR5804YW Yellow Melamine Soup Bowl 10 oz. - 1 doz. $22.99 Thunder Group CR5608W White Melamine Salad Bowl 8 oz. - 1 doz. $23.99 Thunder Group CR5804PR Pure Red Melamine Soup Bowl 10 oz. - 1 doz. 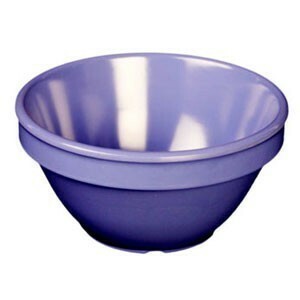 $22.99 Thunder Group CR5608BU Purple Melamine Salad Bowl 8 oz. - 1 doz. $23.99 Thunder Group CR5804BU Purple Melamine Soup Bowl 10 oz. - 1 doz.